Chloe and Samantha met in a grocery store on a beautiful day last June. They hit it off instantly. They had so much in commonthey had gone to the same school, they both had kids, and they both loved Italian food. They had also both finished a diet a few months before. Both women had carefully followed all the diet's rules. Both had a network of friends and family to support their dieting choices. Immediately after the diet, both felt good about their new looks, and they were full of confidence and optimism about the future. They found that they had both been making the same healthy eating choices after the diet. But there was a difference. One of the women had gained much of the weight back. The other had not only maintained her weight, she had lost five more poundswithout any additional dieting. Have you ever wondered what the true key to maintaining your weight is? It isn't always willpower, or being blessed with a low metabolism. It's not that everyone else wants it more than you. If anything, you want it more, which is why you set out to do the HCG diet. The difference is as simple as having the right resources to enable your desires to take shape. And that's why we're sending you this letter. We created our Stabilization and Maintenance Program especially for people like you who want to maintain weight loss after dieting, or even to lose more weight with no extra effort. 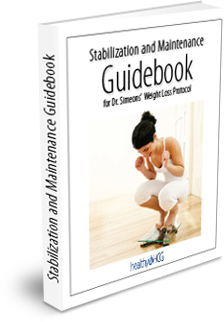 Our Stabilization and Maintenance Program for the HCG diet is unlike anything else on the market for HCG dieters. You see, everything Dr. Simeons wrote about stabilization and maintenance can fit into a few short paragraphs. That has left the many HCG dieters adrift without guidance, and has resulted in too many people regaining the weight they worked so hard to lose. Our Stabilization and Maintenance Program fills all the gaps left by Dr. Simeons. It's the only program that expands and explains the details behind the stabilization and maintenance phases of Dr. Simeons' famous HCG diet protocol. It's the only program of its kind that includes two powerful new supplements that can virtually guarantee success at maintaining your weight over the long termeven if you do nothing else. Comprehensive lists of all foods allowed during the Stabilization Phase. Extra advice on which foods to avoid and which to focus on for best results. Nearly 100 recipes covering both Stabilization and Maintenanceeverything from breakfast to dessert. The 2-Pound Rule explained and expanded to help combat small weight gains. Detailed instructions for figuring out exactly how many calories you should eatand whether you even need to worry about counting! Five simple but extremely powerful tricks to make sure you never overeat again. Two more unique strategies to deal with larger weight gains quickly and easily. Everything you need to know about exercising for weight maintenanceeven if you've never exercised beforeincluding two easy and flexible workouts that can be done at home with no extra equipment. We've taken things to the next level and provided you with a new supplement with all-natural ingredients that are specifically designed to work during the stabilization and maintenance phases of the HCG diet. When you start eating carbohydrates during the Maintenance Phase, you'll need something to protect you against cravings in between meals and in the evenings. GlycoTrim is a blood sugar moderator, with an active ingredient so powerful it is considered a prescription drug in European countries. GlycoTrim works to increase your insulin sensitivity, so sugar is removed more efficiently from the bloodstream. At the same time, GlycoTrim supplies critical ingredients for the production of glucose when your body needs it, so you're protected from both dips and spikes in your blood sugar. You can read more about GlycoTrim here. If you have read Dr. Simeons' manuscript, you know how little guidance he gave for these critical phases of the HCG diet. Don't leave it up to chance. With your Stabilization and Maintenance Program in hand, you'll be armed with everything you need to succeed, so next time you meet a friend at the grocery storeor the park, or on the street, or at the next birthday partyyou won't have to shamefully avoid the subject of your past diet (instead, you'll secretly hope they ask!). 100% Guaranteed ... As Always - We are certain you will love the information, recipes and formulas in this package, and by following the simple instructions you'll have success stabilizing and maintaining your weight. However, if for some reason you want to return the package simply contact us within 90 days for a full refund. No Risk! 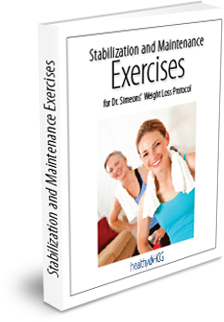 Order now to stabilize and maintain your weight the RIGHT way. In the end, you can't make a mistake buying here: remember our rock-solid guarantee, fast shipping (FREE in USA), and generous, friendly customer support? Go ahead and order now with peace of mind. With this package you'll get everything you need to make sure your weight stabilizes correctly and to ensure you are on the right path to long-term weight maintenance. 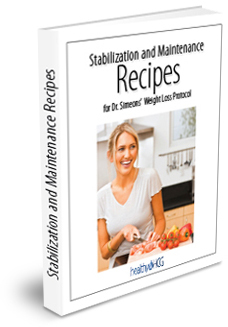 Contains: Stabilization & Maintenance Overview, Recipe Book, Exercise Book and 2 bottles of GlycoTrim, enough to last for the 6-week stabilization and maintenance period. Now with FREE U.S. Priority Mail Shipping!